Sail into life at the beach when you vacation at Mariner’s Cove, a rental resort condominium in North Myrtle Beach, South Carolina. Nestled on the quiet and lovely Shore Drive, this family friendly complex is three stories of uninterrupted fun. The resort is located just across the street from the stunning Atlantic Ocean and white sandy beaches, so you and your friends and family will certainly experience your dream beach vacation at Mariner’s Cove! The aesthetic Mariner’s Cove is studded with gorgeous palmettos, shady oak trees, and luxuriant landscaping. All of the beautifully updated condos are thoughtfully appointed with nice furnishings and pops of color, creating the vibe of a home away from home and a beach getaway at the same time. Release your worries as you explore the resort, discovering all the reasons it is the perfect vacation destination. The rental condominium boasts a large, sparkling pool, ideal for swimming laps or just splashing around, enjoying the refreshing water sliding against your skin. Each condo is conveniently fitted with a well-equipped kitchen. 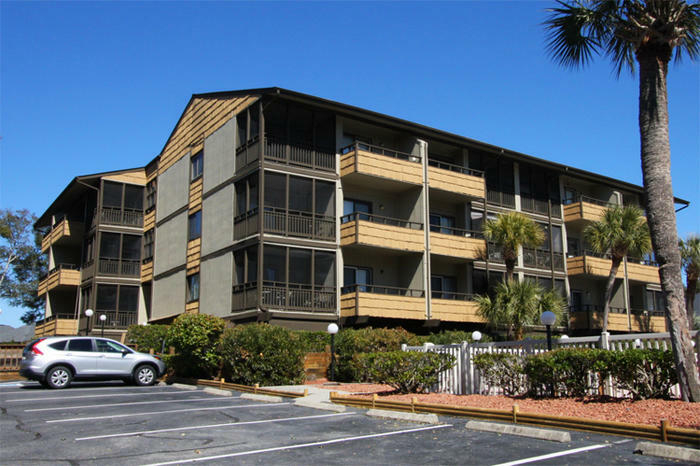 They also feature both screened and open balconies, allowing generous views of the picturesque Shore Drive in North Myrtle Beach, South Carolina. A quick walk across the street gives Mariner’s Cove guests optimum access to the beach, where the sun warms your skin and the sights and sounds and feel of the ocean nurtures your soul. Your Mariner’s Cove resort is in a coveted section of North Myrtle Beach, near endless choices of restaurants and shopping and numerous other attractions. Since North Myrtle Beach is a popular destination for golfers, the area is a treasure-trove of more than 100 golf courses of various difficulties. These include Caledonia, a breathtaking course set in the legendary South Carolina Lowcountry, and the Dunes Golf and Beach Club, which happens to be practically next door to Mariner’s Cove. Both courses are found within the ranks of the Top 100 Golf Courses You Can Play by none other than Golf Magazine. The nearby Barefoot Resort has a golf course that also made that list. Oceanic adventures, zoos, gardens, dolphin cruises, art galleries, arcades, cinemas, live music and entertainment - the fun goes on and on at any time of the day and any time of the year. Your Mariner’s Cove rental condo resort places all of the best of a North Myrtle Beach vacation at your fingertips, while acting as a quiet cocoon to welcome you home every day. Elliott Beach Rentals is not affiliated with onsite management or the HOA of Mariner's Cove.